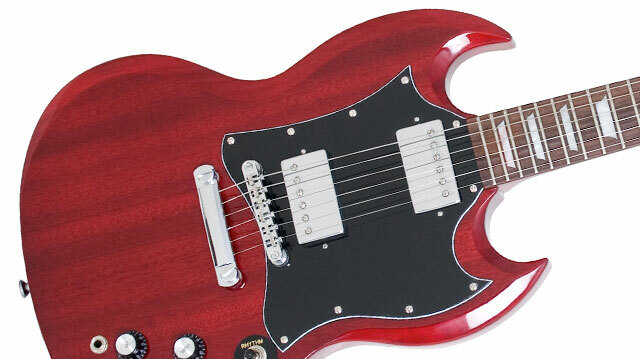 Epiphone honors the historic SG, one of the most original designs in rock, with the Ltd. Ed. "1966" G-400 PRO, which now features Alnico Classic PRO™ pickups and push/pull coil-splitting. The original SG not only rivaled guitars of its own era for sonic variety but also proved to be a sign of things to come. Scores of rock, hard rock and metal guitarists embraced the original SG and made it a classic. Now, the Ltd. Ed. "1966" G-400 PRO gives you the sound and look of a vintage SG without the vintage price tag but with the added tonal variety that you’ve come to expect from Epiphone. When the SG, or "Solid Guitar," was introduced in 1960 as a replacement for the Les Paul Standard, it was called the "fretless wonder" for its low frets and fast action. The twin horn cutaway design was like nothing on the market and its light but balanced weight made it the perfect guitar for stage and studio work. The powerful sound of a humbucker equipped SG has became the go-to guitar for artists such as The Who’s Pete Townshend, Black Sabbath’s Tony Iommi, Paul Weller, AC/DC’s Angus Young, Eric Clapton and Derek Trucks of the Allman Brothers Band. As with all Epiphones, the Ltd. Ed. "1966" G-400 PRO includes Epiphone's Limited Lifetime Warranty and Gibson’s famous 24/7/365 customer service. Visit your authorized Epiphone dealer and make history today with a Ltd. Ed. "1966" G-400 PRO. The Epiphone Ltd. Ed. "1966" G-400 PRO is inspired by mid-’60s era SGs, a player’s and collector’s favorite, and uses the same dimensions and build techniques as vintage SGs made in the Gibson/Epiphone Kalamazoo, Michigan, factory during that classic era. The solid, tone-rich mahogany carved body gives the guitar a balanced feel on stage and in the studio (unlike cheap imitations that tend to be neck-heavy) with an equally classic ’60s-style pickguard. The 1960s SlimTaper™ "D" profile mahogany neck has a 24.75" scale with 22 medium jumbo frets and a 12” radius for incredible reach thanks to the SG’s classic cutaway. 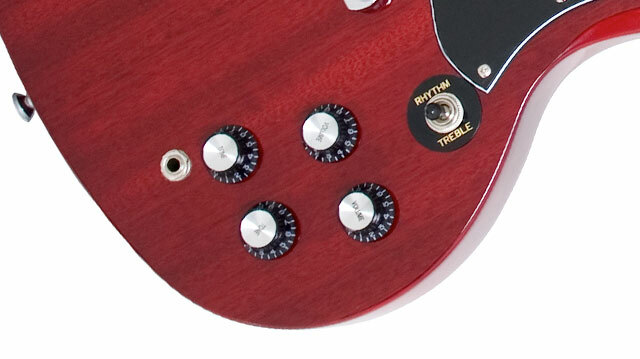 The new Epiphone Deluxe machine heads are also light weight, which makes your Ltd. Ed. “1966” G-400 PRO feel perfectly balanced on stage and in the studio. The Epiphone clipped dovewing headstock features a ’60s-era logo. And for that one-of-a-kind SG feel, the Ltd. Ed. "1966" G-400 PRO has a Pau Ferro fingerboard with a 1.68” nut and pearloid trapezoid inlays. 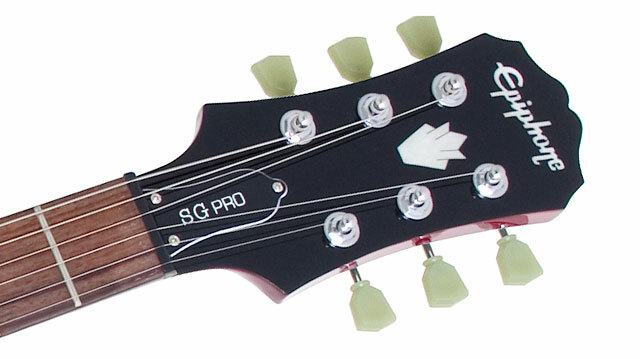 The truss rod cover is the classic Kalamazoo-era bell shape with "SG PRO" in white. Epiphone always finds a way to make improvements on our classic designs and the Ltd. Ed. "1966" G-400 PRO is no exception. Now featuring Epiphone Alnico Classic PRO™ 4-wire humbuckers in the neck and bridge positions, the Ltd. Ed. "1966" G-400 PRO offers a tonal palette that far exceeds any other guitar of its kind. The Alnico Classic PROs™ feature Alnico V magnets for terrific humbucker sustain with a huge dynamic range that can go from clean to crunch at a touch. And now, the Ltd. Ed. "1966" G-400 PRO features coil-splitting on both pickups via a push/pull control on the pickups’ volume controls. Epiphone leads the way in manufacturing great-sounding guitars for players of all levels and that goes for our great hardware, too. Epiphone provides quality, all-metal hardware on all its instruments including full-function volume and tone knobs using full-size 500K Ω potentiometers matched with Epiphone’s rugged, all-metal, 3-way toggle pickup selector switch for long-lasting performance. And of course, the Ltd. Ed. "1966" G-400 PRO features Epiphone’s famous LockTone™ bridge and Stopbar tailpiece, which yields incredible sustain. Tuning is fast and accurate with Epiphone Deluxe 18:1 ratio machine heads. The Ltd. Ed. "1966" G-400 PRO comes in classic Cherry (CH), Alpine White (AW), Ebony (EB), Pelham Blue (PE) and Silverburst (SB) color finishes.